I'll make some more attempts & send you the information. In regards to Twitch, I have seen the reports for Community members. After reading about the posts on Twitch issues in the past, I did two short tests but could not reproduce the issue. Community, can you send me some of the channels you guys are watching on Twitch(the more the better) ? I would like to test them out during various times(morning,peak time etc). Will test Twitch some more & report back. Doesn't seem to matter which twitch stream I am watching. It happens during the day but at prime time it crazy. I'll post some examples when I am watching. I have the stream linked here running right now. So far so good, I will leave it up & monitor. I am located in N-B, on 250/20 CODA modem. Other than that there is the issue with twtich , especially during the day when you have the reload the page every 5-10 minute, and for some reason it only happen with Rogers, Bell don't have this issue. When these 2 items will be fixed, I will be happy like a tree! I'm in Brampton, Ontario and play League of Legends every now and then. Pretty happy to see that my ping is anywhere between 25-40, and people are constantly asking how my ping is so low! It's hilarious! I'm on the gigabit package running the 26T2 firmware on the Coda-4582. Great work so far! I had the stream running for 1.5 hrs while working on some other stuff and it did not freeze up. I did take a look at web code to find the server the video stream was coming from and ran some traces there as well. Going to test some more in the evening. @Mythen did you happen to run a speed test when it was working fine ? Can you also run one when you are having the issue? Let me know if you notice any change. Also I see you mentioned the stream will freeze, but chat still works. Does the video stream come back on the first refresh when it freezes up ? What browsers are you guys using ? That's my speed test currently. 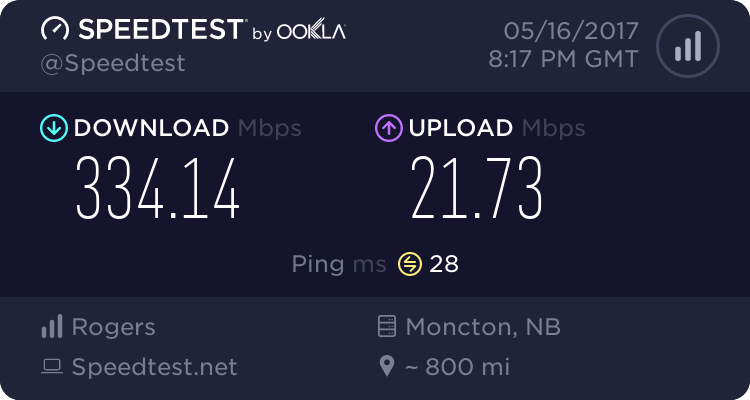 My speedtest is the same as Mythen, with Moncton as the host as well! Tried on IE,edge,chrome,firefox all latest version and I can recreate the issue on any browser. I use a Killer Ethernet adapter with a Cat7 Cable. I have not streamed twitch for a few days thought, I will try again later today and see if the issue is present but it was pretty bad the last 4 weeks.